Hello friends, we have finally decided to give out the new VPN settings to enjoy MTN YouTube Video streaming pack without any stress. Guess what? It's pretty fast, stable and doesn't require you to import any config file. We will be introducing to you a new VPN called Samsung Max VPN. With this VPN, you don't need HTTP Injector or KPN Rev VPN anymore. Samsung Max VPN is very easy to setup and connect in less than 5 seconds. Interesting right? Also note that this VPN will only work when you have MTN YouTube Video Streaming pack. Without wasting much time, let's go straight to the settings. MTN 3G or 4G sim. MTN YouTube Video Streaming data. NOTE: These plans ain't unlimited. The 1 Hour plan is capped 750MB. 3 Hours plan is capped 2.2GB. 5 Hours (12am - 5am) Night Plan is capped 500MB. 3.) After that, install and launch the app. 4.) 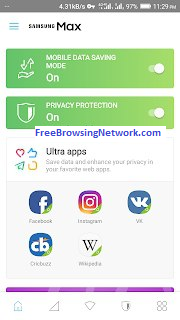 On the main page, activate Mobile data saving mode and Privacy protection. 5.) You will see a count-down on when the VPN privacy protection would stop. To remove the count-down, just click on the last icon located at the bottom-right corner of the app and activate Premium service for free. 6.) After doing that, the count-down will disappear. 7.) That's all. Enjoy your MTN YouTube data using Samsung Max VPN without disconnections, config file, and SSH details. If you love this post, please leave a comment below and don't forget to share this post with your friends and join us on Telegram. Comment on "Samsung Max VPN Settings For MTN Free YouTube Video Streaming Pack"